The Ultimate Guide to Chocolate Chip Cookies Part 3 features experiments with dietary restrictions and various ingredient substitutions, such as gluten-free and sugar-free. CLICK HERE FOR PARTS ONE and TWO and FOUR!! 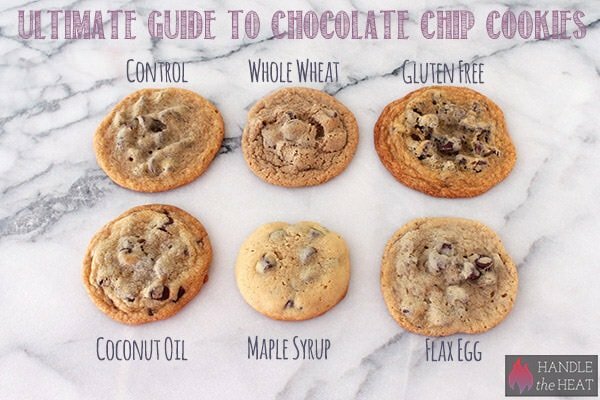 Have you ever wondered what ingredients you could substitute in a chocolate chip cookie recipe for dietary needs? How to make cookies healthier, whole wheat, vegan, gluten-free, egg-free, or butter-free? 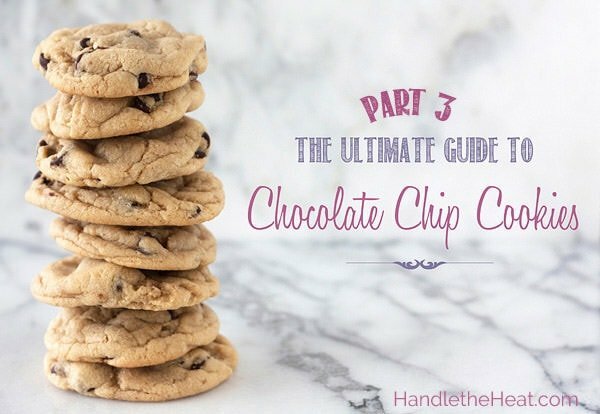 Today I’m SO thrilled to be sharing with you my Ultimate Guide to Chocolate Chip Cookies part THREE! We’re diving into dietary and health restrictions today. I can’t tell you how often I’m asked how to make a recipe work for special diet needs, and I received many requests to do an Ultimate Guide to Chocolate Chip Cookies on just that topic. As someone without any special diet or health needs, this is an area I am fairly unfamiliar with. I thought this experiment would be the perfect way to dip my feet into this world! 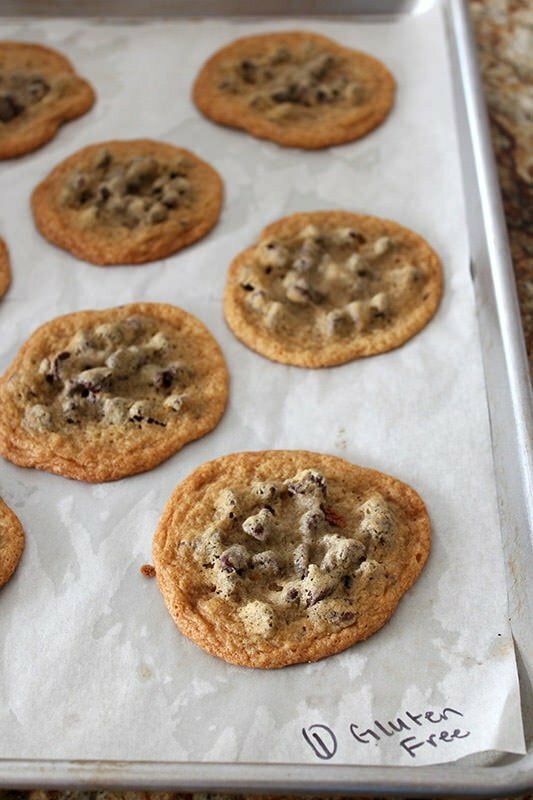 I used an adapted version of the Nestle Tollhouse Chocolate Chip Cookie recipe as my control and made small variations among the ingredients to show you how they affect the cookie, all with dietary restrictions and health needs in mind. I kept everything else the same in each recipe test so we could observe the differences in the finished cookie, photographing all the results for you. See the comparison photo at the end of this post. For this batch I substituted all of the 1 cup plus 2 tablespoons (5 ounces or 142 grams) of all-purpose flour in the control recipe with 1 cup plus 2 tablespoons (4.7 ounces or 135 grams) of King Arthur Whole Wheat Flour, proceeding with the instructions as written. The whole wheat dough was much stiffer than the control dough and the finished cookies were chewy, firm, with a nutty flavor. I was actually quite surprised by how delicious they were, I put a little smiley face on my notes. 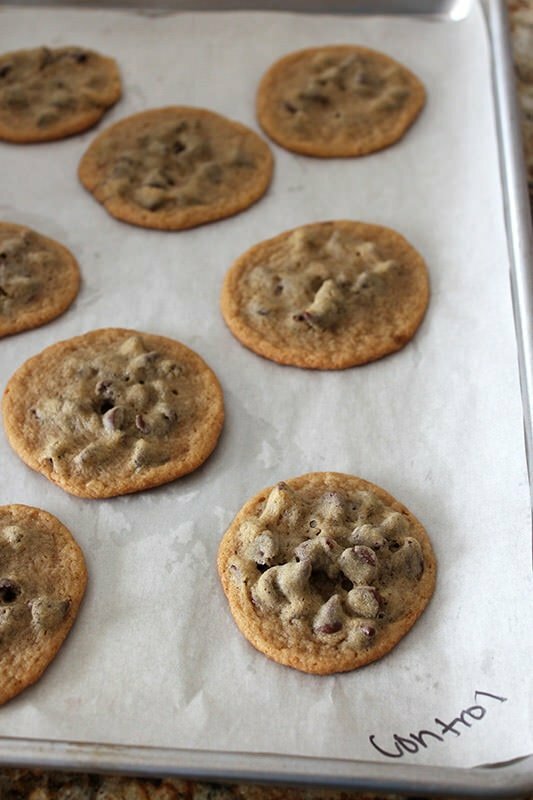 If you’re looking to add more fiber and whole wheat goodness to your diet, you can DEFINITELY get away with substitute half, if not all, whole wheat flour in your chocolate chip cookie recipes. I’m sure white whole wheat flour would be even less noticeable. To make a batch of gluten-free cookies, I substituted all of the flour with the same exact amount of Cup 4 Cup Gluten-Free Flour, as directed in the Cup 4 Cup package directions (the name is quite literal). Beyond Amazon, you can find Cup 4 Cup at Sur la Table and Williams-Sonoma. I know there are MANY blends of flours and various ingredients to create a gluten-free flour mixture but I wanted to use something streamlined that I knew you guys would be able to get your hands on, and not have to spend a small fortune on half a dozen different specialty flours and ingredients. Since those who cannot eat gluten are often well versed in gluten-free recipes, I thought this would be especially helpful to those unfamiliar with gluten-free baking who may need to serve a gluten-free guest occasionally. The gluten-free dough with Cup 4 Cup was pale and sticky. Overall, the Nestle control recipe is a fairly wet dough to begin with so I think when substituting with Cup 4 Cup, the recipe could have used a little more flour. Despite the sticky dough I proceeded, since I was trying to gauge just how effective this gluten-free product is, if it can truly be substituted one-for-one. The cookies unsurprisingly spread fast and flat with crunchy edges. I’d venture to assume that if I were to add a 1/4 cup more of the Cup 4 Cup they wouldn’t have spread so much. When I took my first bite into these cooled cookies I was pretty impressed. If I hadn’t known they were gluten-free I probably would have never guessed. The only change besides that fact that this batch needed more flour was that the texture was ever so slightly grainy. Hardly noticeable though. Cup 4 Cup is definitely a great gluten-free option for cookies, though you may need to experiment to get it just right. I know many people cannot have dairy, so I wanted to experiment with a butter-free cookie recipe. I substituted the stick of unsalted butter (1/2 cup or 4 ounces) in the control recipe with 1/2 cup room temperature coconut oil, weighing 3.68 ounces. I proceeded with the recipe as written and the resulting dough was ultra soft, pale, and slightly greasy. The baked coconut oil cookies were super chewy and moist, with just a hint of coconut flavor. I actually think the coconut scent was stronger than the flavor. These cookies LOOKED just like normal cookies, but were quite greasy. Regardless, they were delicious and had a great overall mouthfeel. Just like dairy, I know many people cannot consume processed sugar. My mom is actually allergic to cane sugar, so I was extra motivated to test out a sugar-free batch. Instead of the combined 3/4 cup total of brown and granulated sugars in the control recipe, I used 1/2 cup of pure grade A dark amber maple syrup. Since I was adding so much liquid to the dough, I also added in a 1/4 cup of additional flour, an amount based off some internet research I did into baking with maple syrup. I used my electric mixer to beat the butter by itself until creamy, then added the maple syrup and beat until very well combined before proceeding with the rest of the recipe as written. The dough was still very, very sticky but I proceeded, trusting my substitution research. To my surprise the cookies barely spread. Usually very wet doughs spread more (such as the gluten-free batch), but these maple syrup cookies remained small, tall, soft, and slightly cakey with a a little crispness at the edges. They definitely had a more mellow sweetness to them, but were still quite tasty. Eggs are a common allergen and I am frequently asked how to substitute them, whether for allergies or to make a recipe vegan-friendly. There’s nothing else in the world like an egg, so I’ve always been hesitant to experiment with egg substitutions. I actually LOVE adding an extra egg yolk in my cookies because it makes them more rich and chewy. So the thought of using NO eggs makes me nervous and unfortunately I am sad to say, it still does. It appears I have more experimenting to do though I’m not quite sure with what – vegan friends can you help me out? The most common egg substitute according to the internet is the flax egg, which is 1 tablespoons ground flax meal mixed with 3 tablespoons water. This is what I used to substitute for the egg in the control recipe. The resulting cookies were flat, grainy, gritty, and super sweet with no depth of flavor. These were absolutely my least favorite of the experiments. I think flax eggs can work well as a one-for-one substitute in many recipes, but to me it’s far too noticeable in a chocolate chip cookie recipe. If you had absolutely no choice in the matter, a flax egg cookie could probably satisfying a cookie craving but I won’t be using it again since I don’t need to do so. What did you think of these experiments? Have you had success with any dietary substitutions in cookie recipes? Will you be trying out any of these substitutions? Let me know in the comments below – I’d love to hear from you! CLICK HERE FOR PARTS ONE and TWO!! I have loved reading this series and these are some of the things I have been wondering about so thank you! I love coconut oil in cookies, but have definitely noticed they are always a little greasy! Pinned! I somehow missed the first installments of this series, I’ll have to go back. My son has soy and corn allergies (among others) and I use the King Arthur’s Flour recipe for crispy chocolate chip cookies, which calls for both butter and shortening. Since I am nutritionally opposed to shortening, I replaced it with coconut oil. So they have 1/2 cup each of butter and coconut oil. They aren’t greasy at all, and hands down the best chocolate chip cookies I’ve ever had. I’ve been making them for 2 or 3 years now, and I am quickly becoming famous for them. They have an almost imperceptible hint of coconut flavor, which is just perfect. The other thing is that I use only Enjoy Life chocolate chips, as they do not contain the ubiquitous soy lecithin. Thanks for all this research – I’m going to make some whole wheat cookies now! My favorite mix of all these is – all brown sugar, equal parts; corn starch, baking soda, and baking powder, coconut oil, and refrigerated dough overnight. What an amazing cookie. The dough is rock hard because of the oil; but I just use a knife to break it up and its fine. We are a no-egg family and I have found that 20g of instant potato (flakes) and 60-80 ml of yoghurt makes for a wonderful egg replacement. I use it in cookies, cakes and muffins that have an oil base as opposed to a butter base and the results are fab! For chocolate chip cookies that use butter I use margarine and it works great. Just an idea if you don’t like coconut taste in the dairy free cookie you can use refined coconut oil. It’s the unrefined coconut oil that has the coconut taste. I’ve been enjoying this cookie series, and I have some suggestions for future cookie experiments. I’d love to see these tested: less flour, replacing brown sugar with a combination of white sugar and molasses, replacing a small (e.g. 5-10%) amount of white sugar with corn syrup or Lyle’s Golden Syrup, browned butter (like the Cook’s Illustrated recipe), and the Cook’s Illustrated mixing method where you rest the dough a few times during mixing. For egg substitutions, I’m not a huge fan of flax eggs, either. It does work better if you blend the flax meal and water in a blender then let it sit for five minutes, than if you simply whisk them together. But my favorite egg substitution is chickpea flour. I add two tablespoons of chickpea flour to the dry ingredients and two tbsp of water to the wet (usually with the vanilla). This is a substitute for one egg, and in a recipe like chocolate chip cookies, the flavor difference is very subtle. You’ll probably want to increase your leavener by a 1/4 tsp, but the high protein content in the flour is very similar to the binding properties of egg white! It uses Ener-G Egg Replacer. Oh my gosh, just found this blog on pintrest and I am in LOVE!!! i would love to do this but i dont have the time! Also my waistline would soooo not appreciate it! So i just love reading all your “experiments”! thank you….I cant wait to try some of the recipies! Hi Kate! Thank you and welcome 🙂 I’m so happy to have you as a new reader! I hope you enjoy my recipes. Thanks for experimenting and saving me some time (and! truthfully, calories)! Great pictures and instructions. I have used flaxseed replacements in several baked goods before, and typically find there to be some grainy texture. I will have to try Meredith’s suggestion to blend first! I usually add two tablespoons of hot water to one tablespoon of flaxseed meal, though, and that seems to work much better for me. More like an actual egg. Cooked out) and stuck it in the fridge for about 2 hours so it could solidify. Still soft but not a liquid. Aaaaamazing cookies. The dough almost tasted caramel-y but the cooked cookie was just a slight variance in flavor. Also I have used Splenda instead of white sugar. Good too. Thanks for your research! I was always curious about using honey in a cookie recipe, would that work just as well as the maple syrup, or would that produce a different result? Hi Tessa, Love all the details in your blog. I am from Malaysia. Looking forward to read more. I will surely very eager to try your recipes and take note of all the info given… Thanx so much Tessa. Try substituting buttermilk for the eggs. I use 1/4 cup of buttermilk for each egg. It gives your baked goods a wonderful, creamy/buttery texture and adds extra moisture to any cakes and muffins. I substitute eggs in all my baking as I am vegetarian and although I do eat eggs my family don’t and they look forward to eating homemade baked goodies at my house as you can’t find eggless stuff in the shops very easily. 1) Use whole golden, not brown, flaxseeds. Purely aesthetic to avoid discoloration. Do not use pre-ground brown flaxseed unless you want gritty ugly flax eggs. 2) Grind 1 Tbsp. flaxseeds extremely finely until floury. A spice grinder will yield better, and faster, results than a mortar and pestle. 3) Add 3 Tbsp. water and stir well. 4) Refrigerate for at least 5 – 10 minutes to allow the flax egg to set. Don’t skip this step. Exposed to water, the flax seeds will release a viscous, protein-rich mucilage — vegan egg white! Tip: Prep flax eggs ahead of time so they’ll be ready when you need to add them to your recipe. 5) Sub for 1 chicken egg. Whip your gloriously slimy pale-yellow flax eggs into any baked good recipe and enjoy. Try substituting the egg for a mashed ripe banana. It adds a nice subtle banana flavour, and who doesn’t love the combination of Chocolate and Banana! I love your breakdown of how each ingredient can change a cookie. 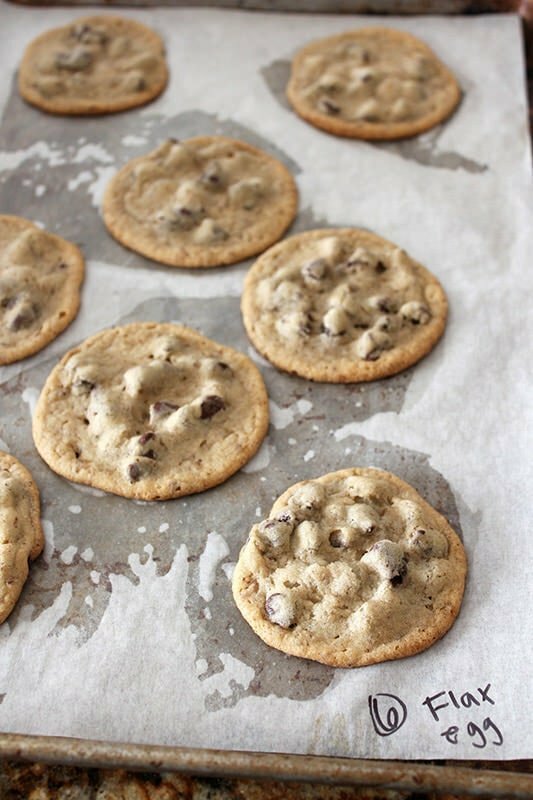 I am always on the quest for the perfect chocolate chip cookie and I will try some of your suggestions! Friendly vegan here. I love that you’ve done this, soo helpful. I wish I could remember where I read this to give her credit, but this tip really, *really* made a difference in my cookie bakes; Use 3 tablespoons HOT water with 1 tablespoon ground flax seeds. I’ve read the oil goes rancid VERY quickly when you break the seeds up, so I’ve never used the pre-ground stuff, I grind a bunch in my coffee grinder and freeze leftovers. it freezes very well. Anyway, mix it well with a fork just like you would beat an egg, and refrigerate it for 20-30 minutes (or longer, I’ve left it overnight) before using. I’ve tried adding it right away and it worked out similar to what you’re describing. Not too good. 20-30 minutes makes all the difference. The flavor of flax I’ve read can be strong, not sure how it would taste with white flour, but when I use it with whole wheat flour it just adds more of a nutty flavor imo. As for the eggs, I’ve done a lot of subs for those, and agree that flax isn’t my favorite for cookies. Often a “sub” isn’t needed, but just a little more moisture. My favorite in cookies though, is actually dairy-free yogurt. I use just 3 tablespoons per egg. Try using chia seeds in place of flax meal for the vegan version, holds up and tastes much better. I personally only use the flax eggs for savory preparations and the chai seed eggs for baking. Try it out! I cannot tell you how much I love this!! Chocolate chip cookies are one of my all time favorite things, and since avoiding gluten, dairy, and sugar it’s been such a mission to find one that works. Just the fact that you’ve experimented with so many variants including gluten free, maple syrup, and coconut oil makes me feel like I’m one step closer to finding my ultimate cookie! I know this was posted a long time ago but I just read it and tried some of them they turned out good. Except I did not like the egg-less. Then I did research and found our you can use 2 Tbsp of water, 1 Tbsp of oil, and 2 tsp of baking powder in replace of an egg. THEY TURNED OUT AMAZING!!! Just like the original recipe did. I enjoy articles like this. It will take me a little while to digest every thing in the 4 parts. I stopped using the dark cookie sheets a year or so ago. I still have several; what if I put parchment on them? I assume that the dark metal will still affect my cookies. I will use your guidelines as to what happens on all kind of cookies. I have some cook books from America’s Test Kitchen that covered some aspects that you have — never never have I seen as comprehensive a job. Thank you. Snowed in this weekend and craving something sweet, as well as needing something to do! Since going to the store isn’t an option, this series was a great way to bake cookies with whatever I had in the cupboard! Used maple syrup instead of sugar, used half butter and half coconut oil, subbed baking powder for baking soda. Coming out of the oven, they look like little ice cream scoops- round in the middle and on top, but with a flatter edge that spread while baking. Now it’s the hardest part, waiting for them to cool enough to taste! Thanks! Is there significant deference if I’m using salted butter as opposed to unsalted. This post inspired me to combine many ideas into one recipe for my family! I used half all purpose flour and white whole wheat, replaced butter for coconut oil, replaced granulated sugar and brown sugar for 1/2 cup + 2 tbsp. 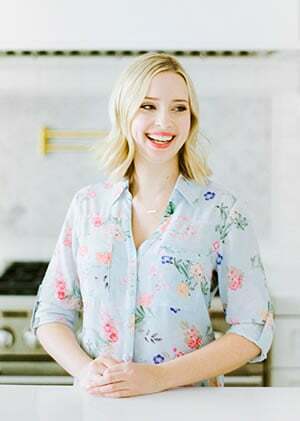 maple syrup, used 2 tbsp water, 1sp canola oil, and 2 tsp baking powder for the egg (my son has egg allergy), ground 1/4 cup walnuts (to hide them), ground 1/2 cup old fashioned oats. All 3 of my young kids like the cookie, thank you. The cookies didn’t spread out very much, but were flavorful moist and crisp. I just came across your post, and it’s great! I’ve been experimenting with coconut oil in my chocolate chip cookie recipe, and I’m having mixed results. It’s not consistent batch to batch, and I don’t like the greasy texture like you mentioned. The flax egg has been perfect though. Flax eggs are great, but not in every recipe. If you don’t want a nuttier taste, then chia eggs are better. I’m using nuts in my cookies, so the flax is not noticeable at all. Also, I know some people grind the flax seed fresh, but I’ve had the best results with buying Bob’s Red Mill Whole Ground Flaxseed Meal. Most grocery stores sell it in the natural section, and it’s not expensive. I store the bag in a ziplock bag in the freezer. I live at 6300ft above sea level. I have tried for a long time to come up with a recipe for drop cookies that aren’t fat. I want my baked cookies to look like the 24hr refrigerated cookies. I have tried Crisco (doesn’t work) less baking soda (to hard) Is there anything else I should try because of the altitude? Thank You for the help. how can I replace the brandy in the fruit cake.